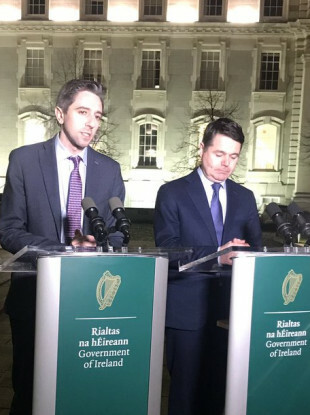 Ministers Simon Harris and Paschal Donohoe briefing the media this evening. HEALTH MINISTER SIMON HARRIS has said what happened outside his home over the weekend was “plain and simple intimidation”. Harris, his wife Caoimhe and daughter Saoirse, who was born last month, were inside the house in Greystones at the time. The protesters, from Fingal Battalion Direct Action Group, Wicklow Says No and the Anti-Eviction Flying Column, left the scene peacefully after gardaí arrived. Speaking about the incident this evening following the suspension of further strike days, the health minister said that to use the word “protest gives legitimacy” to what was “plain and simple intimidation” of his family, his neighbours and his community. He said protest has an important place in democracy, but what happened to himself, his wife and young baby was not a protest, adding that his family was “targeted”. Harris also hit out at the tone of some of the debate that has surrounded him in recent days. Highlighting language in recent media articles over the weekend about “torturing the minister” and “ending his career with a thousands cuts”, the minister said there should be no place for such “emotive language” to be used in the media discourse, stating that it only serves to “dehumanise”. Welcoming the condemnation by the union and others, the minister said politicians and the media perhaps should recognise that there is a way to “scrutinise and hold people to account” while “not forgetting that those who step up to serve the public are, at the end of the day, just human beings”. Email “Harris says protest outside his family home was 'plain and simple intimidation' ”. Feedback on “Harris says protest outside his family home was 'plain and simple intimidation' ”.